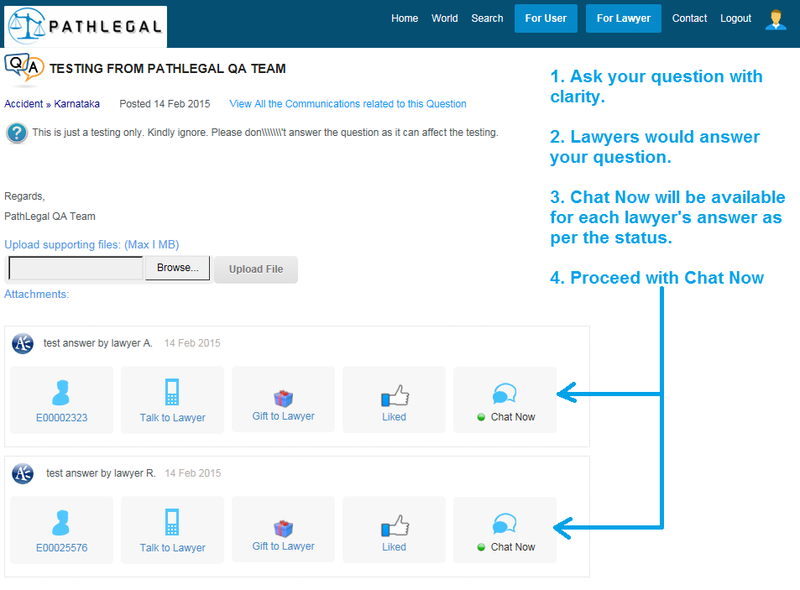 Ask your legal question( Average response time is 10 mins ) & start chatting with the lawyers. Answer will notify to your given email id/Phone. Please login to PathLegal and check your answer incase if you are not received an email notification. Why Paid Service? Free Legal Advice? How does it work? Safe here, Needed for login & view the answers. Note:- PathLegal has no control over the answers provided by the expert. PathLegal will not be responsible incase of any issues/discrepancies with the expert answer. All free questions will publish in the site for public knowledge sharing. You should not include any person or organisation name and detail in the question which would affect the brand or reputation of the other party. Here we provide free online legal advice India over internet within minutes from our legal experts. However we always recommend you to consult with a good lawyer in person for your final decisions.